The Cedar Hills Community Recreation Center was designed as a gathering place for activities of all kinds, including fitness classes, parties, meetings, and receptions. The center also houses the Cedar Hills Golf Club pro shop and “6S” Grille. Located near the mouth of American Fork Canyon and nestled on the east bench of the Wasatch Mountains, the center offers a breathtaking vista of Utah Valley. The Cedar Hills Golf Club is a 6,600 yard,18-hole, par 72 championship golf course nestled at the mouth of picturesque American Fork Canyon in North-Central Utah County. With the first tee shot dropping almost 200 feet from the tee to the fairway, an exciting round of golf is guaranteed right from the beginning. The course encompasses varied topography and view vistas from the highest point on the 14th green, which is 5,253 feet above sea level, to the American Fork River 750 feet below. The Vista Room offers warm and inviting accommodations for wedding ceremonies, receptions, and family celebrations. 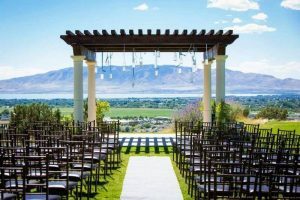 Located along the mountain bench near the Cedar Hills Golf Club, the Vista Room overlooks the Mount Timpanogos Temple and offers a breathtaking view of Utah Valley. For small business meetings, company training events, family movie nights, etc. The room comfortably seats 10 people around the table with room for eight additional chairs. The room also features a flat-screen TV monitor; and a small sink, fridge, and microwave. The room features large windows, which overlook the valley. For more information or to book the room, contact the city’s recreation director, Greg Gordon, by e-mail at recreation@cedarhills.org or call 801-785-9668, ext. 601. Based on availability, two fitness rooms in the basement are also available. For more information or to book the rooms, e-mail recreation@cedarhills.org or call 801-785-9668, ext. 601.